You're going to fall in love with these pretty & comfortable pajamas! They are made of stretchy light weight, jersey fabric. The top has a round neckline with short sleeves. The pants taper at the bottom and have an elastic waist. Available in Standard or Tall lengths in roomy sizes 0x 1x 2x 3x 4x 5x 6x 7x 8x & 9x! Length measurements are taken from the top of the shoulder down. 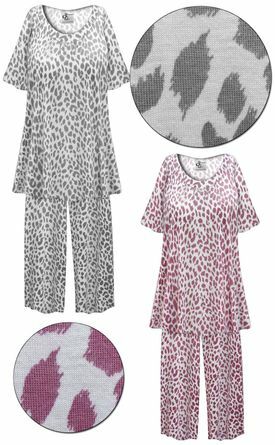 Pajama Top Lengths: ---- Standard: 35" ---- Tall: 37"
Pajama Pant Inseams: ---- Standard: 29"/30" ---- Tall: 32"/33"